Embedded stories have existed for centuries, and many famous storytellers are known to embed their tales. Chaucer’s The Canterbury Tales is a prime example: it features travellers who tell each other stories in an inn. But don’t forget One Thousand and One Nights (also known as Arabian Nights), in which Scheherazade continuously tells stories to her new husband, to delay her execution. In modern times, new media feature their fair share of embedded stories, as is the case in films (such as The Green Mile), but also in games like Assassin’s Creed. Ubisoft gained some experienced with Prince of Persia: The Sands of Time, in which the Prince tells his story to princess Farah (notice the thematic parallels with Arabian Nights), but the developer really went all-out with Assassin’s Creed! The story of the series concerns Desmond, who is able to experience the memories of his ancestors using a machine. 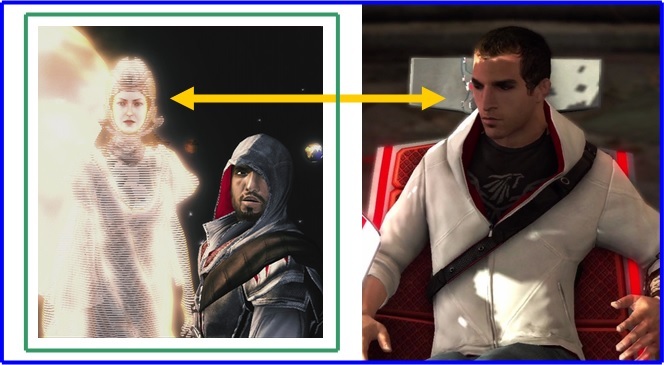 Besides an embedded story, Assassin’s Creed also features embedded gameplay: the first game in particular contains Desmond-sequences that have a vastly different gameplay than the sequences of his ancestors. The goal of an embedded story is to connect multiple (smaller) stories to one overarching tale. Assassin’s Creed is no different in this respect. In Assassin’s Creed 1 to 3, Desmond functions as an anchor, a fixed point that the player is able to use to keep track of the embedded tales. By using Desmond as an anchor, the player is able to experience several different historical periods through Desmond’s ancestors Altaïr, Ezio and Connor. While the present day sequences are generally disliked by the players; they are (narratologically speaking) actually incredibly important and fascinating! The entire story should be linked together in this manner, so that the complete structure can be made visible. Assassin’s Creed 3 never had the intention to tell the (new) story of Connor, but mainly wanted to close Desmond’s. It’s my opinion that the majority of the players never picked up this interpretation, and that is a pity. The game was now judged based not on its own intention, but based on what the players wanted it to be. It should come to no one’s surprise that disappointment can be the only result. Finally, there is an iconic moment from the series that is simply fascinating. It displays a quite rare narratological phenomenon called metalepsis. Metalepsis means that the telling world is contaminated with the told world: for example, characters from one story level start to converse with those of another story level. In Assassin’s Creed, this phenomenon occurs at the end of part 2, when Ezio encounters the ‘goddess’ Minerva, who suddenly directly addresses Desmond instead of Ezio. Minerva even looks directly into the camera, meaning that the player is under the impression that he too is spoken to directly! In this image, the blue and green borders once more represent the different story levels and what happens within their borders. The yellow arrow indicates the direct interaction between characters from different story levels, penetrating the ‘natural’ borders of those story levels. In this instance, these characters are Desmond and Minerva, while Ezio most definitely feels ignored, not to say confused. Ubisoft has truly used Assassin’s Creed to play around as much as possible with narratological constructs and techniques. While I’ve shown how this has led to some amazing results, my argumentation may also explain why the sequels past AC3 feel so much different than their predecessors. The common denominator has disappeared: Desmond’s story is finished and the series is now looking for a new anchor. I don’t think they quite settled on one yet. Even though I’m personally still enamoured by the present day segments of the series, it’s obvious that the absolute coherence is missing. Ubisoft appears to be aware of this, as is proven by their announcement that they want to spend more attention to the present day stories from now on. Nonetheless, I’m hungry for Ubisoft’s next display of narratological acrobatics! Come on, Ubisoft, put our minds into overdrive! Funny you should ask for a part 2, because I have played a number of Assassin’s Creed games since I wrote this article and Ubisoft has clearly changed their (story) direction. So maybe it is time for a part 2!